We have been stuck in that holiday swamp! As you know, we are big proponents of the fruitcake. Now every year, we think about doing our fruitcake post in September or October giving everyone a fair chance at actually making a fruitcake while giving it time to mellow. But we never do. This year, we have been reading on the Internet about an Australian fruitcake made with a scant three ingredients. The Internet has also given us alien autopsies and a chubacabra or two, so we were skeptical. One day while exploring various drawers and shelves in and around the kitchen, we found a box of raisins that seemed to be full. Upon opening it was clear this box had been the resting place of countless bags of dregs from the baking world. 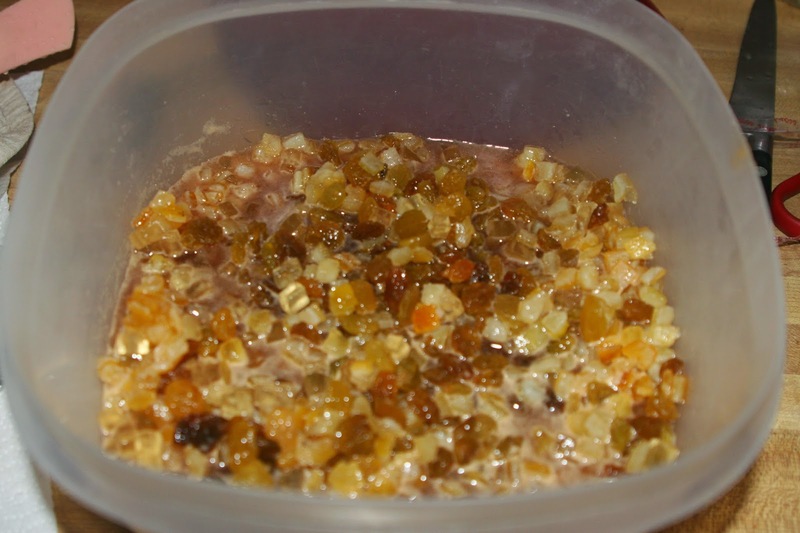 The were about two tablespoons of currents, half a cup of shriveled sultanas, mealy raisins, and something else that at one time had been a dried fruit. Not wanting to toss out perfectly good, if less than perfect dried fruit, an experiment was in order. 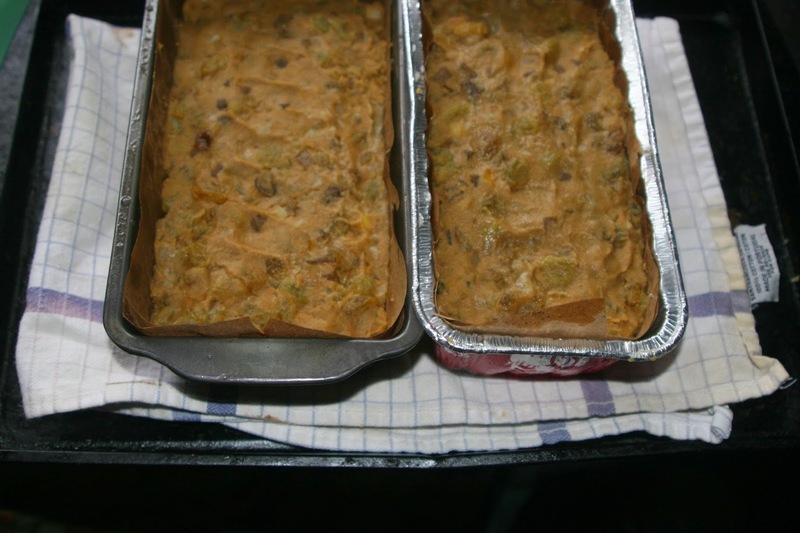 Armed with my Australian recipe (above), we set out to make the three ingredient fruitcake. Much to my wondering eyes...the cake was pretty and good! Not to mention, way easy...easier than any other fruitcake ever made. So we stocked up on really nice fruit and set off to make the recipe our own. Soak the raisins and peel in the Carolina Wild and rum overnight. Line 2 loaf pans with parchment or brown paper. Spray with oil. Set on a baking tray. Mix the flour into the juice and fruit. Spoon into prepared baking pans and bake for about 90 minutes. Remove from oven and brush with additional rum while warm. My goddaughter has been having an awful time with gluten. Even rice flours have been giving her fits, so we have been experimenting with sweet potato flour. It is quite dense and often overpowers baking, but it seemed a fine match for fruitcake. For our gluten free cake, we kept with the lighter color scheme -- yes, baked goods can have a color scheme! We used sultanas and a mix of lemon, orange and citron for the fruit. We needed to leaven the flour so we used our own homemade baking powder (cream of tarter and baking soda) but you can buy gluten-free baking powder. As for "doctoring" the cake, one tends to forget that many spirits, like bourbon are make from grainy products. We did doctor this with some lemoncello made with a potato vodka. Soak the raisins and peel in juice overnight. Mix the flour and baking powder into the juice and fruit. Remove from oven and brush with additional juice or acceptable spirit while warm. There is still time to make one and have warm fruitcake for Christmas. Even the fruitcake haters loved these loaves. And... we hear that chubacabras are fond of them, too.